Imagine if Mt. Rushmore were located in the heart of the Austin neighborhood. The world would be beating a path to our door. The 100,000 tourists that come annually to explore the Frank Lloyd Wright Studio, a scant mile and a half west of our community, would never go home without engaging Rickshaw Rick to pedal them to the site of the world-renowned monument. The 400,000 yearly visitors to the Chicago Children’s Museum on Navy Pier, whose motto is “play and learn,” could be persuaded to take a short CTA train ride to Austin to show their children one of the most breath-taking attractions on the planet. With so much attention from the world, the city of Chicago would be hard pressed to continue to ignore the infrastructure needs of Austin, the most populated of the city’s 77 community areas. Police protection of residents and visitors would be as commonplace as it is at every Cubs game. Our politicians would be embarrassed to allow our schools to continue to be more suited to a third-world dictatorship. Green space would automatically be a part of the city’s renewed attention to our neighborhood. The well-kept secret is that Austin already has its own Mt. Rushmore. The Laramie State Bank Building is one of the finest examples of Art Deco commercial architecture in the world. In 1929, architects Meyer and Cook undertook a massive overhaul of a modest one-story building that originally housed the Ruzicka Drug Store. After the renovation, the Laramie State Bank was awash with butterscotch-colored terra cotta tiles. Each tile was sculpted by Chicago artisans employed by the Northwestern Terra Cotta Co., which had contracts with prominent architects, such as Louis Sullivan and Frank Lloyd Wright. The hundreds of tiles on the building’s façade depict a wealth of images, including industrial workers laboring in factories, surrounded by rivers of coins, squirrels and bees preparing their larder for the winter; an American Eagle sinking its claws into the globe; and a contented family gathering for a meal. The theme of the façade is the importance of hard work and savings to the American experience. The Austin neighborhood has the opportunity to turn its reputation and livability around in one fell stroke. 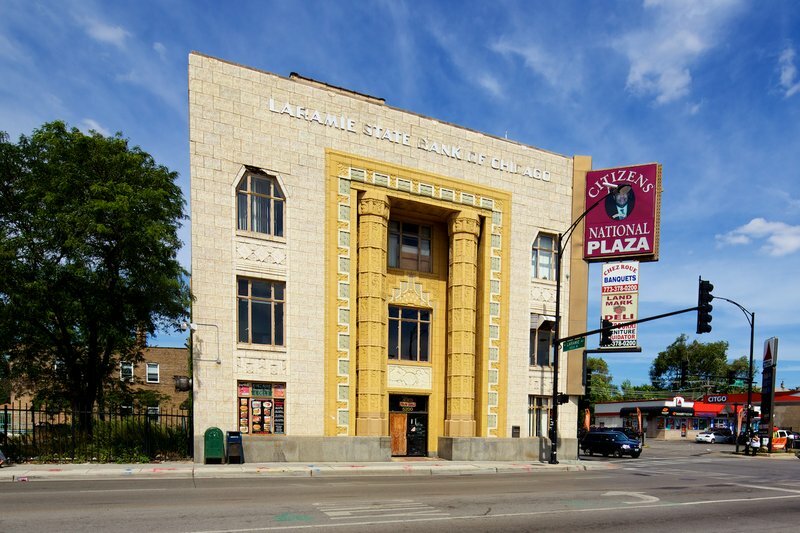 Public acquisition of the Laramie State Bank Building, at the corner of Laramie and Chicago avenues, for the purpose of establishing an arts, culture and history museum, smack in the middle of Austin, would enliven a slowly emerging commercial corridor along Chicago Avenue and instill civic pride among our residents. Austin could join Bronzeville, Andersonville and Pilsen as neighborhoods that are anchored by a museum and cultural center. The Laramie State Bank Building is an architectural treasure. It sits on a large piece of land that could serve as a staging area for the music, art and theater talents of Austin’s young residents. 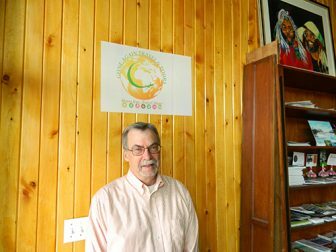 A restaurant, gift shop and trained tour guides could provide jobs of substance to our youth, as well as physical and intellectual nourishment to world travelers. Professional and selfless management of the museum and cultural center would insure benefactor and foundation support for the unrivaled enterprise. The Austin neighborhood has a history that reflects the cruel impact of race relations in America. Originally settled by European immigrants fleeing impoverishment and persecution in their homelands, Austin attracted dozens of architectural landmarks, many of which still exist. Columbus Park was designed by world-famous landscape architect, Jens Jensen. Homes along Midway Park and Race Avenues reflect the gentility of the Victorian age. By the 1930’s, Austin supported a thriving manufacturing district, including the now-abandoned Brach Candy Co. and the Meyercord Decal Co., at 5323 W. Lake St.
By the 1950s, Austin High School was considered one of the best high schools in the Chicago area, with a perennial powerhouse of a football team. Then came the Great Migration. By 1970, white flight, aggressive blockbusting, and commercial and housing disinvestment turned Austin into an apartheid community, separated from the rest of the world by our own Berlin Wall, known as Austin Boulevard. Word has it that the Cook County Land Bank Authority may soon acquire the Laramie State Bank. To permit this community resource to be sold and used for anything other than an Austin cultural center would be the equivalent to selling Mt. Rushmore to the Russians or, closer to home, Chicago’s public parking meters to private interests. The main question is whether Austin has the vision and the ability to collaborate to bring such a project to fruition. James Bowers has lived and worked in Austin for more than three decades. His home is in the Seth Warner Mansion on Central Avenue, a national landmark for its Italianate styling and one of the oldest houses in Chicago. He is a practicing civil rights attorney, founder of Turn Back the Hands of Time Antiques, and partner in Gone Again Travel & Tours, the first African-American owned brick and mortar travel agency on Chicago’s West Side. Another hearing is scheduled for later this fall to discuss the future of the long-vacant Art Deco building at 5200 W. Chicago Ave.
Elected officials joined the advocates at the Nov. 19 meeting at La Follette Park Field House to hear about the benefits of mentoring and youth councils. NAJWA Dance Corps is putting on the dance series, which runs through the end of the month.